You can count on the experts at CHS Hedging for trusted market intelligence and insight to help you grow. A subsidiary of CHS, CHS Hedging is focused on helping you make the right decisions for the right reasons. Are you looking for responsive service? Easy-to-use online access? Advice from a broker that truly understands your operation? Having a strong marketing plan can help enhance your profitability and help you grow. 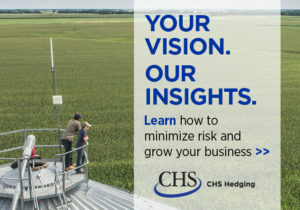 Recognized by Futures magazine as one of the Top 50 Brokers leading the industry since 2005, CHS Hedging has provided risk management services in the agriculture and energy sectors for more than 25 years. You can learn more about the services, including financial and market planning through Russell Consulting Group, at chshedging.com.